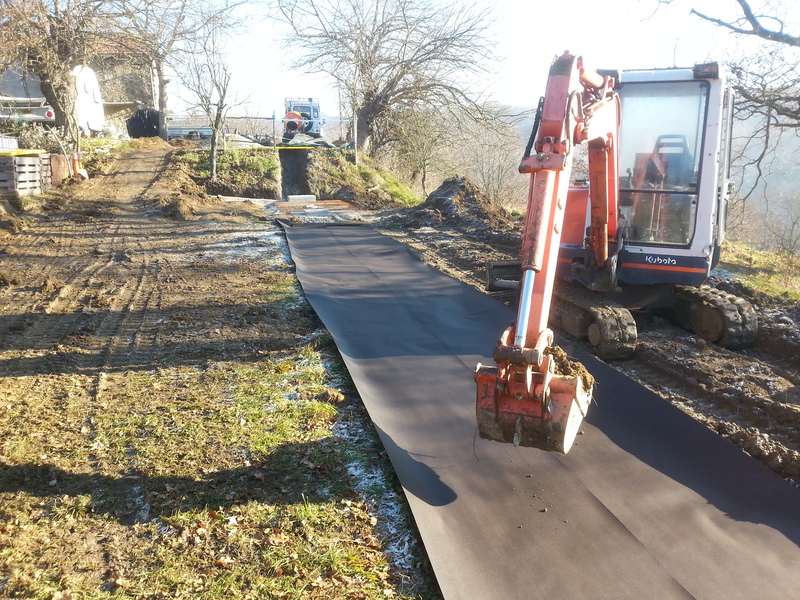 This work does fall under the control of the Guardia Forestale and hence the need for a project and movimenti terra as explained in earlier posts, due to the amount of excavation and the fact that the resulting outlet waste flows out into the surrounding land. 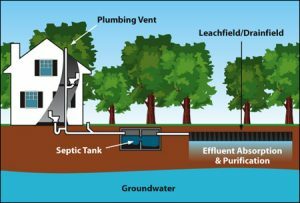 This we applied for at the same time as the planning application for the house, so with full permission to go ahead, it was time to bring the house sewerage system into the 21st Century. The Fossa Imhoff consists of two main parts – the digestion tanks and the run off trench. 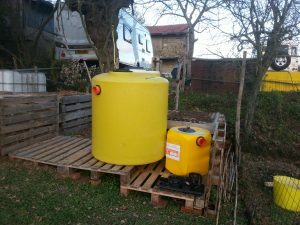 The tanks come in various sizes depending on the number of users and this needs to be specified during the planning application process – e.g 3 users, 5, 10 etc. For a small house like ours, we opted for a 5 user 12€ system as there was quite a jump in cost and size to go for anything bigger, but we wanted to make sure it was big enough for us plus guests and to suit the size of house when it is finished. There is also a separate de-greaser tank that pre-processes waste water from the kitchen sink, showers etc. to ensure the main digestion tank functions correctly. 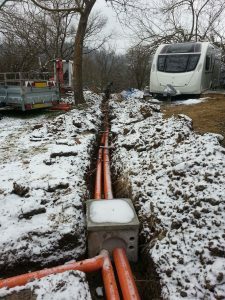 The second part of the system is the drainage trench or ‘leachfield’. Our house and land are too far away from the public sewer system and we do not have a suitable water course nearby that would be suitable for the run off water, so we had to create a drainage system to filter the water into the ground as it leaves the digestion tank (which by the time it leaves the tank should already be fairly clean and non harmful). 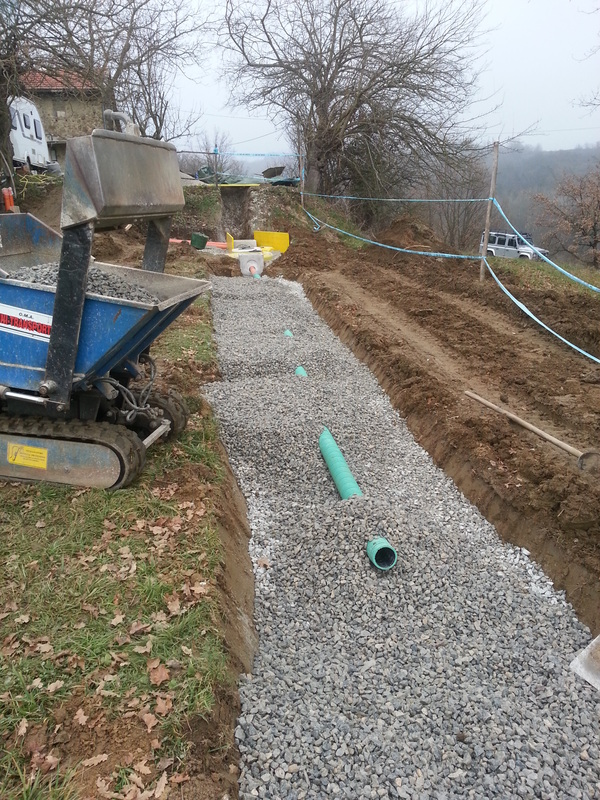 We needed a Geologist to produce the necessary design 6€ for the trench as it is crucial to understand the type of soil we have to ensure the run off water will soak into the surrounding ground without creating flooding or other such problems. Back in August last year we arranged for ‘a man with a digger’ to come to our house and meet our Geologist to dig a test hole in the field next to the house to determine the best location and size of trench that we would need. The trench needed to be deeper than 1m so it was vital we had more than this in ‘soil’ above the local bedrock. Now you would expect that using said man with said digger, we could simply stand aside whilst others did the investigations – hmm. 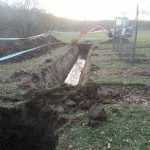 Being August, the ground was extremely dry and too hard for the little one tonne digger to dig much deeper than 800mm – said man suggested it would be much better to be done in autumn after a bit of rain and would gladly return to try again (and of course accept another payment for this no doubt!!). Just hold on (aspetta un attimo), I said in my now improving Italian, let me try by hand. So into the hole I jumped, armed with an old pick axe we found in the fienile when we bought the house. I did manage to dig a bit deeper and between me and the digger we got to 1m when, thankfully, the Geologist said basta – she had seen enough and was happy with the ground conditions – phew! It was too hot to be digging in August, but I think I earned some respect from the man with the digger who gave an acknowledging nod and a smile – at least I interpreted it as acknowledgement, or maybe it was more of a smirk at the crazy Englishman digging in full sun – who knows? But one thing we did now know was that we had the right ground conditions for the drainage trench, we just needed to know how big it needed to be. 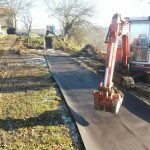 We were astounded when we received the final design – 25m long, 1.5m wide and 1.5m deep – that’s around 50 tonnes of soil to shift, and then refill with the same amount of gravel!!!!! WHAT? Perhaps they thought we were preparing for war and needed to protect our land from the enemy troops. We had thought perhaps 10m long and 1m deep at the most and had originally discussed locating it at the front of the house near the road, but at 25m long, it was a good job we had bought the field adjacent to the house as this was really the only practical place to put it. 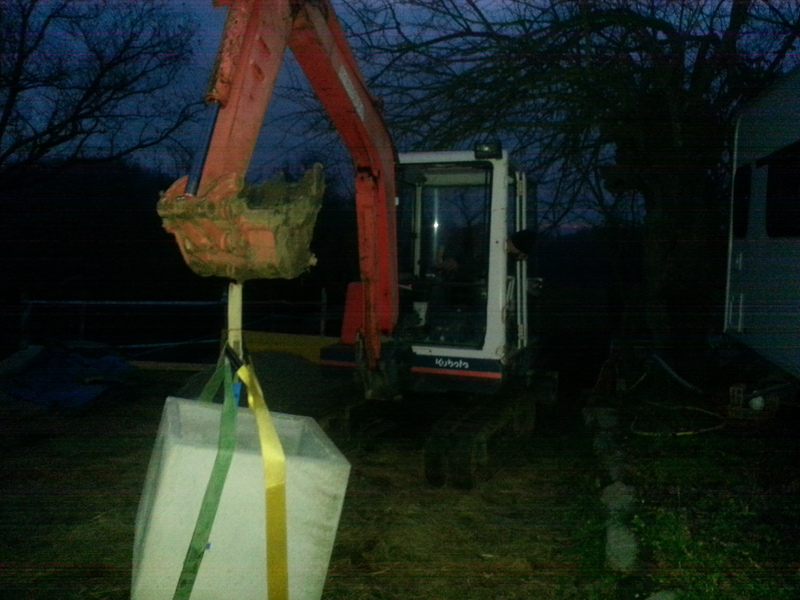 When we finally received all our permissions for the work, it was approaching winter, but with a mild start forecast, and news from a friend that we could borrow his excavator free of charge 13€ for as long as we want (Italians can be very generous! 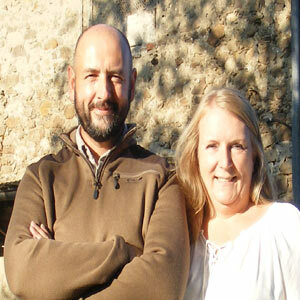 ), we decided to bite the bullet and go for it – much to the surprise of virtually everyone else we spoke to who all thought we were mad to do anything through winter. Does nobody work through winter we thought!? Anyway it is not our way to wait, so we consulted with our Geometra to confirm the exact position of the trench and out of the blue he said the design was way over the top and that 6m long would be plenty! Had he not been party to the design I wondered, but he explained that officially the trench needs to be designed for the worst possible case and that if we ever had any problems we could simply extend the trench in the future. So we erred on the cautious side and opted to go for 12m long, resulting in nearer 20 tonnes of soil to move. After the worst rains for 20years fell a week or so before we planned to start the excavations, the ground was indeed much softer as ‘man with digger’ had suggested, and a couple of days playing with our newly acquired toy had the trench dug and the holes for the digestion tanks completed. Our Geometra arrived to inspect our work, said we had done a good job (we are still in the honeymoon period of having to impress him so he will trust us to continue doing all work ourselves where possible), and left us to continue with the installation of the tanks, connecting pipes and to re-fill the trench with various levels of differing sizes of gravel to create the necessary filtration system. 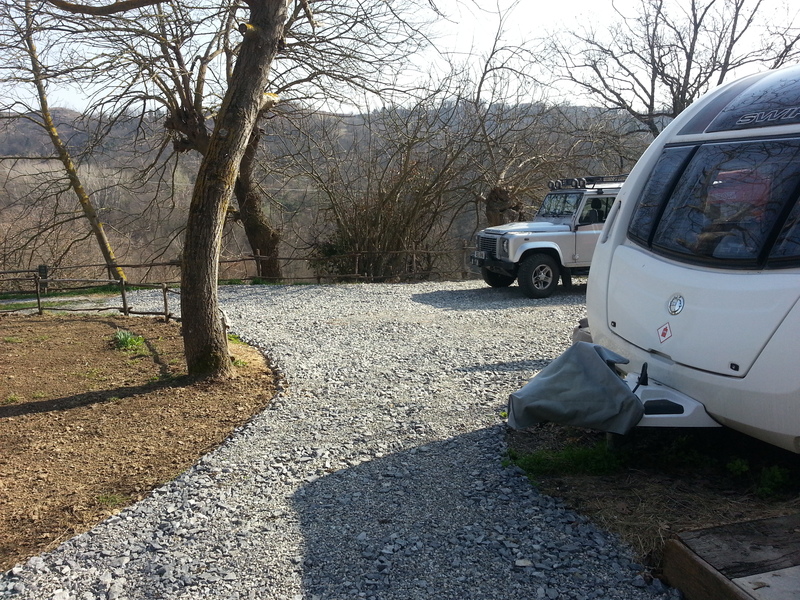 It is one thing to excavate around 20tonnes of earth, but it is another to refill the resulting trench, carefully, with gravel in precise layers – you can’t just have a lorry tip it in, especially when the driveway is too narrow for a large wagon and the field is at a lower level than the access area. So what to do, what to do? 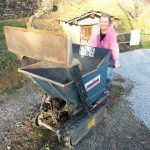 Tell another friend what you are doing and wait for them to tell you they have a motorised wheelbarrow 13€ that would be perfect for the job – and you can borrow it whenever you want!! 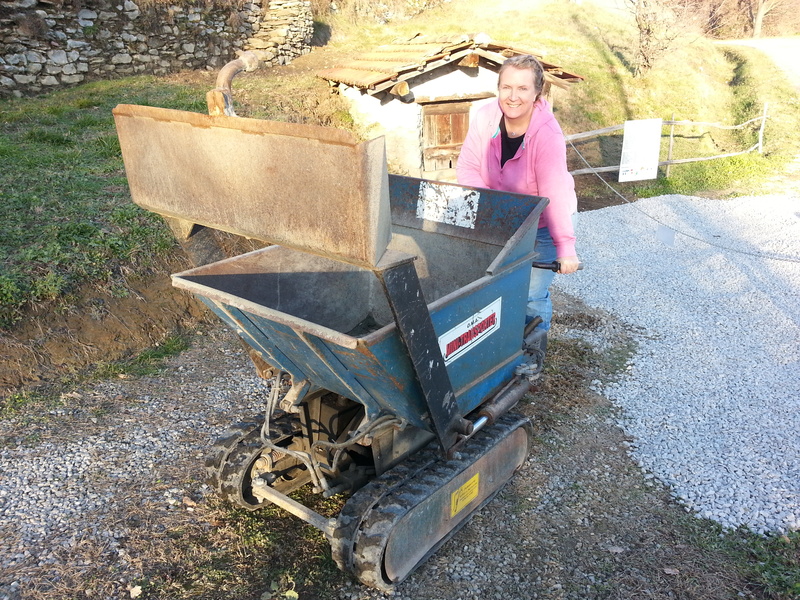 Now that’s what I call a wheelbarrow! So there was no stopping us now. 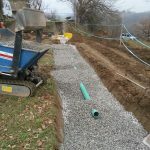 The trench needed to be dug out quite accurately with sloping sides so that the water that flows through the system is guided through the layers of gravel instead of directly into the surrounding soil – there is a long perforated drainage pipe 14€ that sits near the bottom surrounded by large sized gravel 15€(15mm to 30mm), then a layer of fine gravel (8mm to 15mm) above, then another perforated drainage pipe connected to the Fossa outlet. 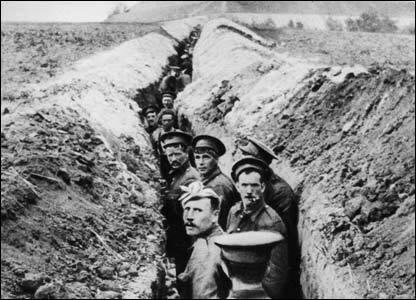 The function of these pipes is to evenly distribute the water along the entire length of the trench. The top drainage pipe is again surrounded by large gravel, then a layer of bitumen impregnated waterproof ‘paper’, and then covered with earth. 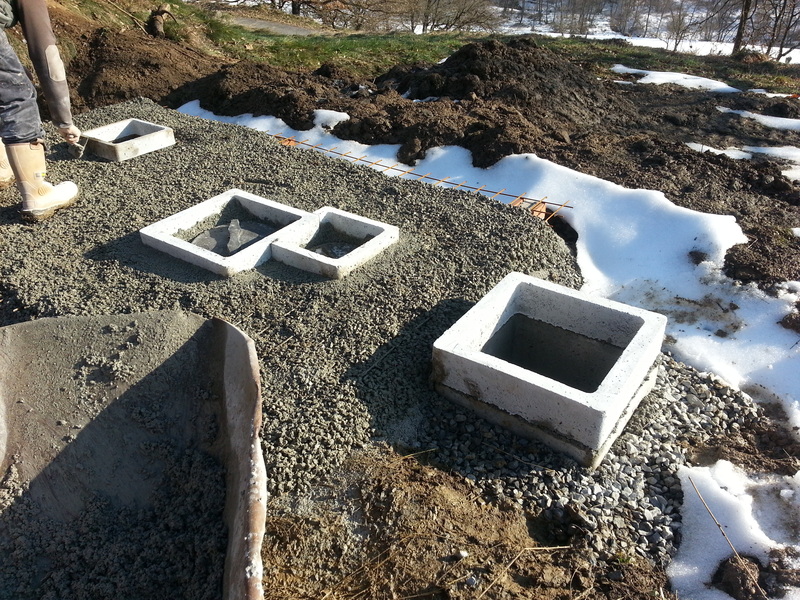 We dug out the holes for the tanks, placed a layer of gravel in the bottom and then lowered the tanks into place (they are fairly lightweight so were easily lowered in by hand). You then need to surround the tanks with approximately 100mm of course sand 16€. As the holes were not exactly precise circles, we used metal sheeting wrapped around the tanks to allow us to fill the gap around the tanks with sand and fill in around the outsides with soil – we did this in 300mm high sections before lifting the metal sheeting each time and continuing the process to the top. As you fill the gap around the tank, you also gradually fill the tanks with clean water to ensure there is even pressure to prevent the tanks collapsing. 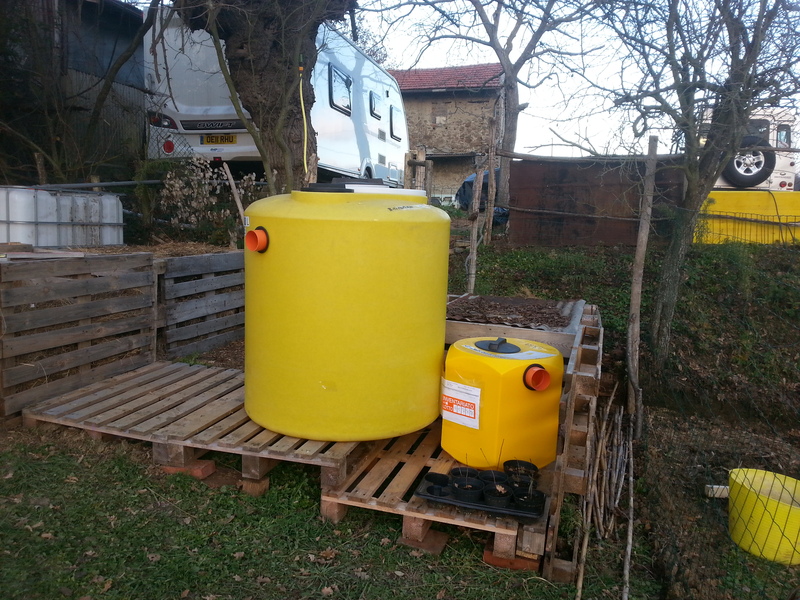 Also, as the tanks are not particularly rigid (you can use concrete tanks but these are much heavier, more expensive and not readily available – our plastic tanks were bought from a local DIY superstore and transported home on our friend’s trailer), we needed to lay a layer of reinforced concrete 17€ over the top to support the weight of the soil we would use to cover the area. We used some concrete lintels similar to those used for a new window or door opening, to support some steel mesh which we then covered with concrete. 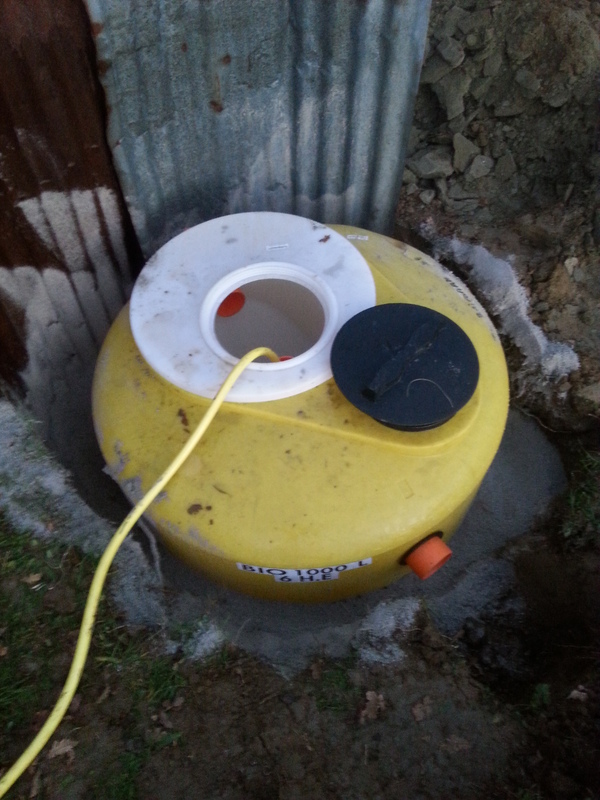 At the same time, we installed concrete inspection housings to retain access to the inspection hatches of the tanks. 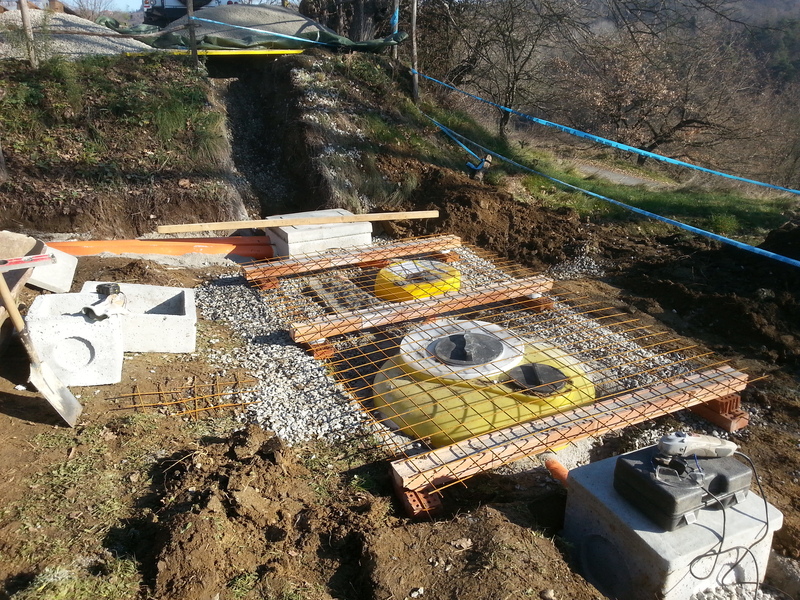 Prepping for concrete to cover the tanks – the reinforcing mesh and concrete beams ensure the weight of the soil and grass that we will cover them with will not squash the tanks. We covered the tanks with semi-dry concrete mix to reduce the weight on the tanks whilst it sets – we sat the concrete chamber rings around the tanks’ various inspection hatches into the dryish mix and then allowed the humidity in the ground to fully cure the concrete. 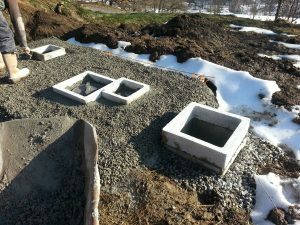 Fortunately we had managed to get the tanks in the ground and the trench re-filled with the specified layers of gravel, impermeable sheeting and a covering of soil to hide it all, before we had a foot of snow – we really do have fate on our side. Next up was to dig the trench between the house and the fossa to run the soil pipes. 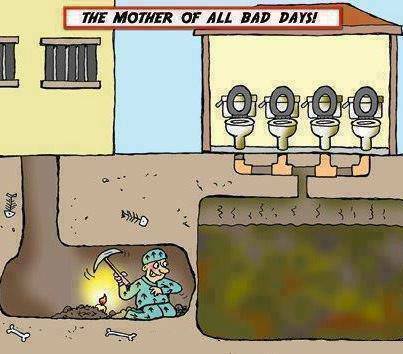 Now in the UK we were used to running everything from wc’s and sinks in one 110mm diameter pipe to the sewers – not here! Oh no, that would be far too simple! Instead, there are different pipes for the wc’s (black water) and the rest (grey water). Grey water which could contain grease, oils and soaps needs to run through the degreaser tank before joining the black water before entering the digestion tank. This means two sets of pipes running parallel for the entire length – simples? But wait, what size pipes – 110mm throughout? Nope. Having no real direction from our Geometra, it was left for us to determine the best option. For a 3 or 5 person system, the inlet pipes for our digestion tanks are 100mm (but do check first – not all are the same which we found out the hard way). One of the tanks we originally considered had 125mm inlets so we designed (and purchased!) 125mm pipe sections for the runs between the house and the tanks as we naively thought this would be the standard. Rather than try to send the pipes back and swap for smaller, we decided to install the larger pipes on the basis that if we did ever want to increase the system size for extra users, the pipework would at least be big enough 18€, so not too much of a problem except 125mm pipes are much more difficult to fit into tight spaces which we were about to regret! 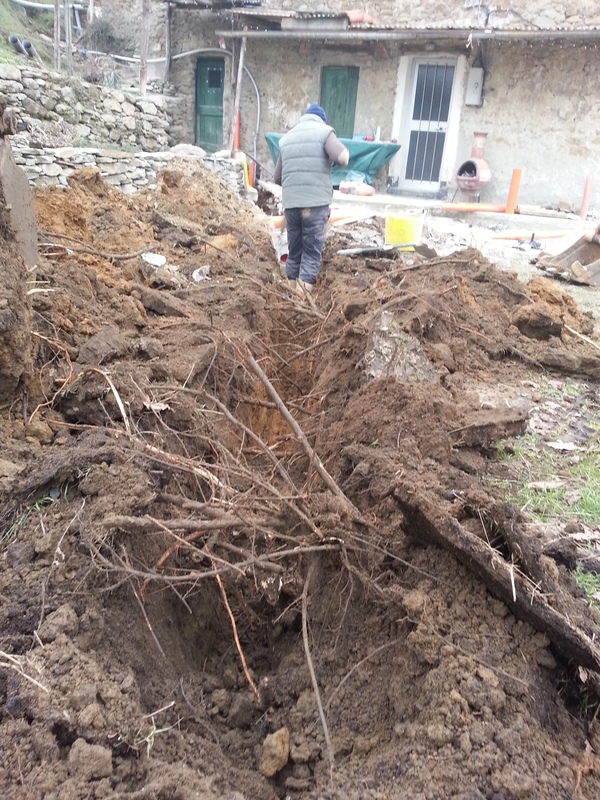 Roots galore – lets hope the trees stay upright in strong winds! 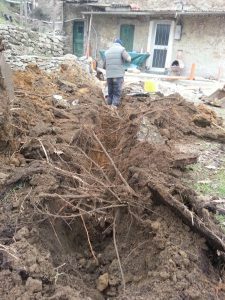 Aside from dodging roots from our walnut tree, and making a complete mess of the garden, the trench for the pipes was straight forward (actually it has a slight curve to it, but you get the drift). It was when we came to running the pipes into/under the house that the colourful words began. The walls of the house are 500mm thick stone, and when you try to go under these at a 45degree angle which we needed to do, this becomes over 700mm. 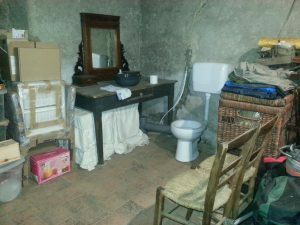 When we bought the house, everyone including us swooned over the fact that old houses were always built in the best locations – ours is no exception. The views, shelter from the wind, south facing to keep heating to a minimum, built on solid rock so it will never subside etc. Wait a minute did I just say built on solid rock? We didn’t consider the fact that drainage pipes would need to run at a level considerably lower than this to get the necessary falls between the bathrooms we wanted! When you try to dig a trench at a depth of 800mm, below 700mm deep walls through solid rock, it is not much fun – when this trench then runs for 4 metres through the cantina, it is down right sickening! Digging out through solid rock is not much fun! Due to the restricted route we needed to take, all I could use was a small hand drill with hammer setting to try and drill/chisel my way through. I had three walls to go under! 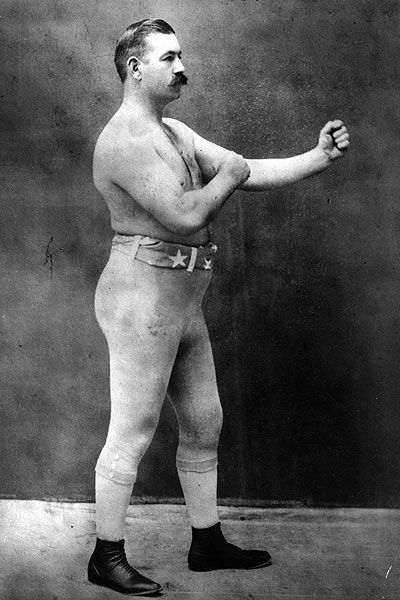 It took almost a full day to get through each wall section – by the end, my hands looked like I was a bare knuckle boxer! But with the trench done, all that was left was to connect all the pipes together (glued joints below ground – not rubber seals as we were used to in the UK), checking we had a fall of 1cm every 1metre (we were used to running pipes at 1:40 rather than the shallower 1:100, but our Geometra told us that this was ample and that the resulting slower flow is better for the fossa to function as it will not be flooded each time we flush the loo!). Along the route at various junctions and direction changes, we installed concrete inspection chambers 19€ to house the inspection sections of pipework – T pieces with screw lids so you can inspect and if necessary flush out the pipework should there ever be any blockages. Worth noting is that a 400mm square concrete chamber section (they come in heights of 300mm each piece and you just add as many as you need for the depth of the trench, and then angle grind the last piece to the required height) is fairly heavy but manageable between two of us, but the 600mm chamber that we needed at a point where we had two sets of 125mm pipes and Y-junctions to fit in, is considerably heavier! I saw a photo on the internet of 4 big men carrying one and just thought ‘how many men to change a …’ , but now I know why! 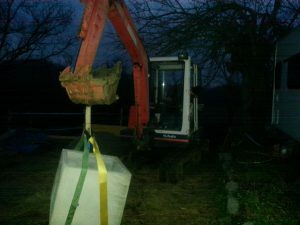 Fortunately we still had the excavator, so just as the light was fading, we attached some lifting slings, ‘carried’ it into place and lowered it into its new home. Big pipes, junctions and inspection points need a bigger chamber! 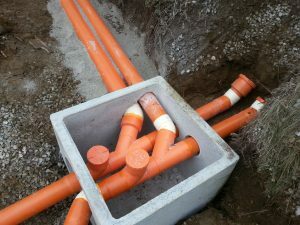 The more observant of you may have noticed we have mainly used orange pipe but some connections are white. 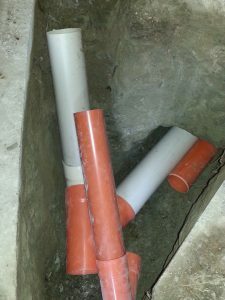 The orange pipe is much stronger, so is the obvious choice below ground, but the joints are very similar in both colours (white has slightly thinner walls and costs a bit less). However, our local builders’ merchant did not stock some of the joint fittings we needed in orange, so we opted for some white fittings where they would not be subject to compression from surrounding soil rather than order and wait for the right bits in orange. 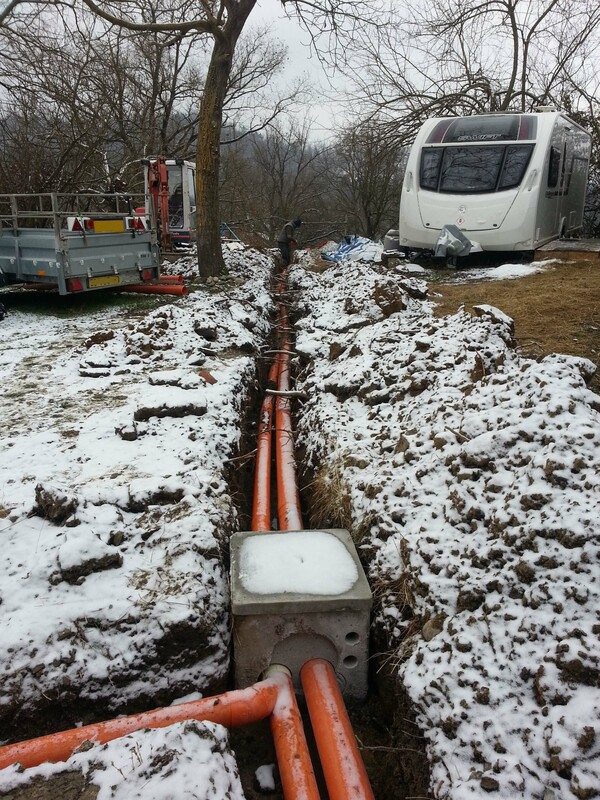 We were delayed a few days waiting for another snowfall to melt before making the final connections. We installed a ‘temporary’ wc at the start of the pipe run – temporary, as the floor of the new bathroom needs re-enforcing, but for now we just wanted a flushing wc 20€ in the house that visitors can use rather than us continually having to explain to non caravaners how to operate a caravan wc – ‘pull that lever, push that button, but not for too long as the pump is starting to burn out etc…’ – far easier to say upstairs on the right! With the full system now connected and tested with a few flushes, we part filled the trench around the pipes with course sand (to ensure the full run is supported adequately and that any movement in the surrounding soil will not affect the line up of the sections), before covering the whole lot with soil. In areas subject to heavier traffic such as the driveway area, we covered the pipes with a 150mm layer of concrete above the sand. We also took the opportunity whilst having the excavator in the garden to do a bit of landscaping and create a nice level and mud free drive area 21€ and new lawn. But with temperatures inside the house a cool 6degC and no way of heating it, we shifted our attentions to creating a chimney for the old cast iron stove (stufa) that we acquired with the house. Only just read above blog (have been forgetting to check) and now I think I need to go and lie down as I feel quite exhausted. Can’t imagine how you both coped! It was a big job to get ticked off the list. It doesn’t look much now as the grass is starting to grow over and hide all or hard work – but we still remember doing it!